Gene Mundt - Let's Talk Mortgages & Real Estate! : How Prepared are You? In an average year, 1200 tornadoes are reported? That a tornado has the capability to lift 20-tons? The winds of a tornado are clocked at 200+ mph? That those winds can drive a blade of grass through walls, lumber, and more? That the months of April, May, and June typically have the highest number of tornadoes reported each year? On average, tornadoes claim the life of 80 people per year? That the National Weather Service in Chicago rated 2015's Tornado Season as the most active since recording started in 1950? All reasons to take tornadoes seriously and to take measures to protect yourself. A Tornado Watch: Is issued by the NOAA Storm Prediction Center meteorologists. A Watch is issued when atmospheric conditions are favorable for the development of severe thunderstorms capable of producing tornadoes. A Tornado Warning: Is issued by your local NOAA National Weather Service Forecast Office meteorologists. This means a tornado has been reported by spotters or indicated by radar and there is a serious threat to life and property for those in the path of the tornado. A Warning is issued when a severe thunderstorm has developed and has either produced a tornado or radar has indicated intense low-level rotation in the presence of atmospheric conditions conducive to tornado development. To prepare/protect yourself in the event of a tornado or tornado conditions, it's wise to put some precautionary safety measures into place beforehand. Ownership papers for your car, etc. If no basement/cellar shelter is available, head to the lowest level/most interior portion of the building. Clean-up, but take precautions with flammable and hazardous liquids, etc. Wear gloves. 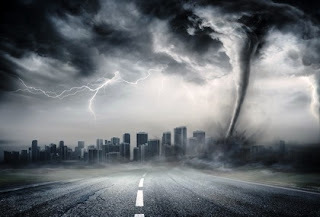 Preparation ... and practice of safety precautions prior to a tornado occurring are the most effective measures to be taken in regards to tornadoes and their aftermath. Do both now. * Hoping to Buy or Refinance a home in Chicago or elsewhere in the Chicagoland area? Contact me! I'll put my 37 years of Mortgage experience and expertise hard to work on your behalf. Gene, this post is an important reminder on how to prepare and what to do in any weather emergency, not just tornadoes. Thank you for sharing it with us! Gene - I don't think I'd have the nerve to live where either tornadoes or hurricanes were common. Hi Gene - Important tips! While we live a bit west of the zone, we have seen the damage tornados can cause up close, and they're nothing to fool around with. Gene I was not aware of most of those facts about tornado's. I have never been in an area hit with a tornado and hope I never am.